Are you thinking about buying a garden shed but are unsure what all the different options and features mean? 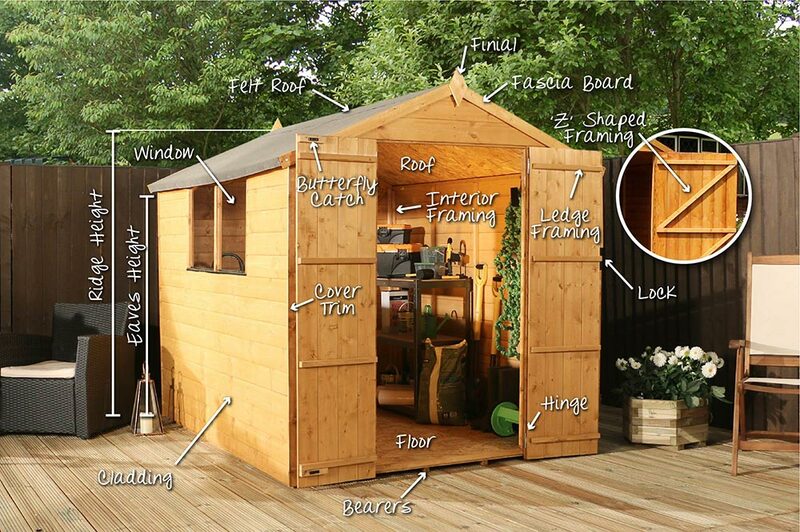 Whatever you’re planning to use your shed for, our handy shed terminology guide will help explain all the components to ensure you choose the right garden building. Portabase – Our portabase is a wooden framework which can be purchased as an additional option, offering structural support. Bearers – Our timber bearers run underneath the shed floor to provide support to the building, as well as raising it off the ground to increase airflow, protecting against damp and insects. Floor – All of buildings feature an OSB or tongue and groove floor which offers a sturdy foundation for storage. ‘Z’ Shaped Framing – We used ‘Z’ shaped framing on most of our doors to provide structural support, preventing bowing and sagging. Ledge Framing – Ledge framing often features three timber batons which are secured to the inside of the door to strengthen the structure. Cladding – We have three types of cladding available, overlap, tongue and groove and shiplap+. All of our wooden sheds are clad with quality FSC certified timber. Windows – All of our window garden sheds are glazed with shatterproof styrene, a much safer alternative to traditional glass. Butterfly Catch – All of our wooden garden sheds are supplied with a butterfly catch to keep the doors secured in place, helping to prevent sagging. Lock – Most of our buildings are supplied with a pad-bolt which can be fitted with a padlock to keep your items secure. Interior Framing – All our buildings feature interior framing to support the structure and provide additional strength. Roof Felt – We supply roofing felt as standard with all of our wooden buildings to protect against weather damage. There are options to upgrade to a high quality felt to offer further protection. Cover Trims – Cover trims cover the join of two panels to improve the sheds appearance and prevent water ingress. Fascia Boards– Fascia boards provide a neat finish to the building, sandwiching the felt between the building. Finials – Finials are supplied to cover the join of the fascia boards and offers a decorative finish to the building. Apex – The traditional apex roof is where roof boards meet at a point at a central point of the shed to create an equally sloping roof from side to side. It typically has more headroom and space for storing larger items. Placing shelving in the eaves of the shed helps to maximise the interior space available. Reverse Apex – A reverse apex roof is similar to the traditional apex with a central point but slopes from front to back rather than side to side. The door is typically placed on the longer side of the building, creating greater headroom. Pent - A pent roof is often made from a single panel and slopes towards down towards the rear of the building. The door is typically located at the front of the building as this offers the most headroom. The sloping roof prevents the build-up of rain water, protecting against weather damage. Overlap – Overlap is a great value cladding. It's called "Overlap" as the boards simply overlap each other, allowing water to run off easily. It's nailed through on to the framing and features a rustic rough sawn finish. Due to the open pores of the timber, it allows wood treatments, preservatives or paint to really penetrate the wood giving it a great finish. Tongue and Groove - Tongue and groove cladding interlocks together to form a solid, robust panel. The interlocking system, offering extra rigidity and helping to reduce draughts. This cladding style makes it ideal for those who will spend more time in their shed. Shiplap – Shiplap combines the appearance of overlap with the construction of tongue and groove. Shiplap cladding features a recess at the top of the individual boards which helps water run-off, offering protection against the elements. This is the best quality cladding and will last for many years to come. Dip treated- Dip treating means that the timber has been submerged or sprayed with a basecoat treatment that protects it against rot. Once you have received the building you can then paint it with the colour or treatment of your choice. This will need maintaining but will give you a 10 anti-rot guarantee for your building. Pressure Treated- Pressure treatment means that the timber has had wood preservative forced into it under pressure. These preservatives mean that you don’t have to treat the building immediately. What you intend to use your shed for will help determine what size you will need. Think about what you will be storing in your shed or if you require space to work. If you need help deciding what size garden shed will best suit your needs, our expert sales team are on hand to help or visit our Shed Buying Guide . All of our products will feature a ‘Specification’ tab which will feature the exact product dimensions where you can find information such as the door height and door width. Corner Chalet Connections- Corner Chalet Connections feature on our log cabins where the tongue and groove boards interlock together. They provide additional strength to the build and help to reduce heat loss. Safety Glass Glazing- A stronger and safer alternative to traditional glass. If broken, safety glass is designed to shatter into small pieces rather than dangerous shards. Double Glazing- Opting for double glazing will help retain heat and reduce noise levels. Shingles- Shingles protect your wooden garden building from weather damage and feature a honeycomb design. Veranda- A roofed area outside of the garden building, often with decking which is used as an outdoor seating area. Arbour- A wooden garden bench with shelter,typically features an apex design with trellis side panels for growing vine plants. Gazebo- A garden feature that features a roof with open sides, typically used for providing shelter over outdoor seating. Arch- A wooden structure that provides entrance to the property, divides sections of the garden and frames pathways. Carport- A sturdy structure that provides shelter for vehicles, often features a polycarbonate roof with open sides for easy access. EN71- Most of our playhouses are EU EN71 Toy Safety Tested which means that our products are safe to use. Rounded Framing- The framing used in our wooden playhouses is planed and rounded to remove the risk of splinters. Door Gaps- A 12mm gap is left around the edge of the door frame of our playhouses to prevent trapped fingers and injuries.